Since 1998 Italian artist Antonio Riello has been making very special weapons as artworks. Assault rifles, pistols, machine guns, carbines, sub-machine guns, hand grenades, rocket launchers and any kind of contemporary military guns are restyled by the artist as high fashion accessories for sophisticated ladies. Riello transforms weapons from all over the world: American M16, Russian Kalashnikov, Israelian UZI, Italian Beretta and many others. He has also explores armours in steel, plastic and Kevlar are made to protect ladies against urban dangers. In this project the glamour of fashion system is mixed with the common perverse and morbid fascination for weaponry. These works - made using leopard skins, brightly lacquered colours, jewels, furs, trendy fabrics and special technological appliances - play along the thin line between fashion and trash. 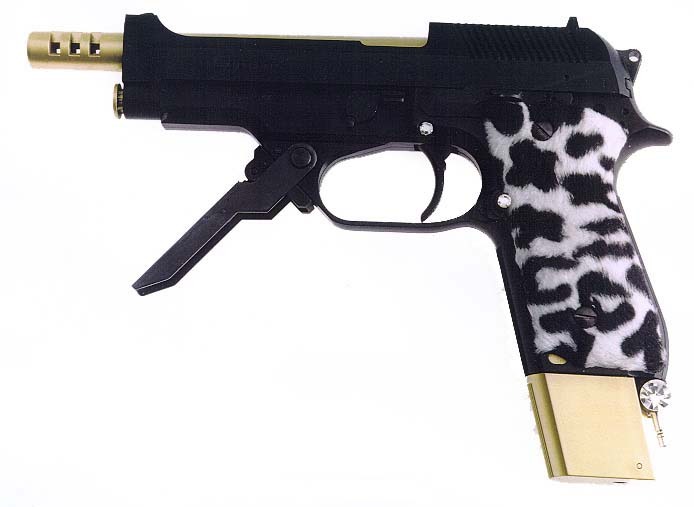 LADIES WEAPONS are a sort of hybrids born from the most outstanding contemporary Italian features: the obsession for personal security and the passion for elegance and fashion. Every artwork has a feminine name - CLAUDIA, TAMARA,... and exists only in one exemplar.